Creativity is a unique racial philosophy in that it is a racial religion, complete with creed and program that covers all aspects of the individual, the family, society and the environment. Creators view life and base our worldview on the entire White race, not from the perspective of a single ethnic group or nation-state. Creativity has been developed through a learning and understanding of history and science, allowing us to take the best of all ideologies and create a unique worldview better than anything the White race has had before. 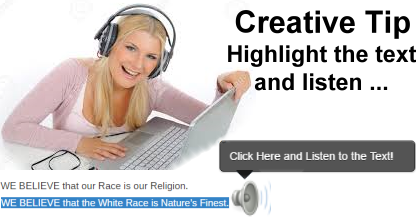 One part of the Creator philosophy that is most unique is that we replace all the anti-White influence in our lives with new concepts that represent our race exclusively. Creativity is an alternative to the Jewish mind poison of Christianity, that has been a dagger in the spine of the White race since its inception over two thousand years ago. We intend to replace every last vestige of Christian influence in our lives, including the Gregorian calendar system, which counts years from the believed “Incarnation of Jesus,” the central character in the Judeo-Christian fairytale. Never again should we place any worth in the Jesus character, one that cannot be substantiated by evidence or offer anything positive or beneficial for the White race. Never again will we refer to our calendar system in terms of “Before Christ” or “Anno Domini.” Creativity has a replacement to this calendar system that is easily understood and put in to practice by Creators in their daily lives. Note: Instead of B.C. and A.D. for calendar date comparisons, Creators use the convention of B.C.E. (Before the Common Era) and C.E. (Common Era) as often used in scholarly literature. They correspond to the same dates as B.C. and A.D., but without alluding to the birth or death of an alleged Jewish Christ. The Creator calendar system is centred around the foundation of the first racial religion for the White race, Creativity. Creativity was founded in 1973 of the old calendar system, when our Founder – Ben Klassen PME – published Nature’s Eternal Religion. This year was the Birth of our racial religion and will represent the year “0,” or Incepto de Creativitat. Although it is uncommon for a calendar to include a year “0,” we feel it important to acknowledge the year that the White race created a living racial religion for its own Survival, Expansion and Advancement. The years previous to the Inception of Creativity are known as Prius Creativitat, or “Before Creativity.” The year our Beloved Founder was born (1918CE) is known under the Creativity calendar as 55PC. In historical and academic discussion of times before Creativity, Creators should use “PC” to signify the years, rather than the Christian system that has been used in the past. All the years leading up to the present and in to the future will be known as Anno de Creativitat, or “Year of Creativity.” The year in which this article was written (2010CE) is known under the Creativity calendar as 37AC. The publication of The White Man’s Bible was in 8AC, or the 8th Year of Creativity. These years can be simply converted from the Gregorian calendar to the Creativity calendar, by subtracting the Gregorian year from 1973 [2010 – 1973 = 37AC], or for a PC year we do the same in reverse [1973 – 1918 = 55PC]. Commemorates the White conquest of the Australian continent in 185PC. Birthday of our beloved Founder, Ben Klassen PME in 55PC. Anniversary of the publication of Nature’s Eternal Religion in IC. Anniversary of the foundation of the old World Centre in 9AC. Reverend Brian Kozel, Creator martyr murdered in 17AC. Day IV Ingenuity, Day V Memorial, Day VI Law, Day VII Purity. Commemorates the White victory over native American resistance in 83PC. The Creator Holy Days are just another example of Creativity’s replacement of anti-White influence with a Racial Loyalist alternative for the White race. The days acknowledge and commemorate some of the most important events in the history of the White race. It should be noted by Creators that the new calendar system does not alter the positioning of leap years, nor do the number of days in a month or year change. The Creativity calendar was designed with simplicity and practicality in mind, we intend for it to be put in to practice by all Creators, with the hope that it replaces the anti-White references that have been used until now. So, my White Racial Comrades, this new system has been established for you. Make it a part of your daily life and share it with your Brothers and Sisters, inspire them to adopt the racial creed of Creativity, the only religion that represents the White race exclusively without the inclusion of Jewish or anti-White influences.